I ordered one CD (Seeds of Courage) for Shaan to check out the music based upon some recommendations from friends. I chose “Seeds of Courage” because Shaan has had a difficult time adjusting to preschool (he started attending 2 days a week for the first time this year). The “drop-off” in the mornings has been hard on him, so I thought we could sing these songs about courage to remind him that God is always with him. Shaan has already been singing the songs by himself around the house – it’s so incredible hearing him “sing” the Bible and it’s provided us with some really good discussion time. For instance, he’s asked me what certain words from the song mean – and it’s given me an opportunity to try and explain to him the meaning of the Bible verses. 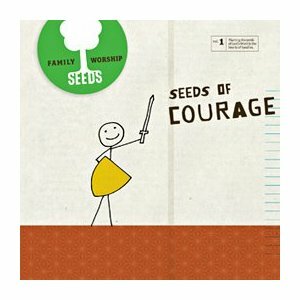 Oh, also, one more really quick note about something neat “Seeds Family Worship” is doing…they include two CD’s in your purchase – one for you, and one to share. How awesome is that?!?! They really do encourage us to “spread seeds” and help send God’s Word to as many homes as possible! We have the sampler CD and it is great. I love that you can listen to all of their music through their website. One night we were driving in the car, all 8 of us, and everyone was jamming out to the word. All of us were singing along. It was of those moments that you store in your heart and remember always.